Fortnite needs no introduction. Ever since its Battle Royale gamemode came out it’s been taking the gaming world by storm, and by now just about every gamer in the world will have heard of this phenomenon. But whether you’re a veteran or a complete newbie; there’s one thing that doesn’t change, and that’s the fact that you need good gear in order to play to your full potential. To help you with that we’ve analyzed the mice that our pro players are using, and we’ve come up with a list of five of the most used mice for Fortnite. 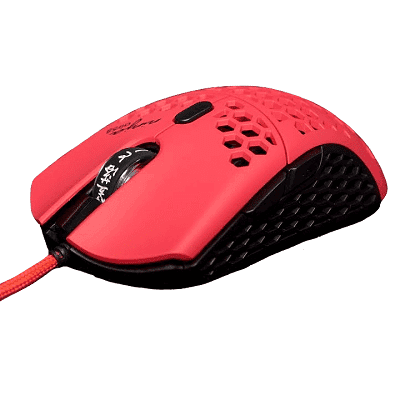 A mouse is obviously something subjective and largely comes down to personal tastes, but using this list as a guideline can be a great start when choosing a new mouse. What makes a mouse good for Fortnite? Fortnite is a relatively simple game, in the sense that you don’t have a metric ton of abilities and buttons to press. You do have to be able to build fast and switch weapons on the fly, so having a mouse with a few side buttons is definitely a great idea. All of the mice on this list feature at least two extra buttons, as well as a top tier sensor (Fortnite is still a shooter game, so you’ll need a great sensor) and solid internals. Since it’s a shooter and you’ve got to be able to aim well it’s important to choose a mouse which suits your grip style and hand size too. After all, being able to aim precisely and comfortably is arguably the most important skill in the game. Logitech produces great quality mice, though recently their shapes weren’t always universally loved. Their latest effort, the G Pro Wireless, seems to have hit all the right marks however. It’s been creeping up in the most used lists across all of our analyzed games, and Fortnite is no different in that regard. The G Pro Wireless takes the Victory Royale here, but Logitech’s older offerings also take a piece of the pie, with the G502 and the G Pro Wired (which, confusingly, is a completely different mouse when compared to the G Pro Wireless) rounding out the top five. The G502 is an especially interesting entry, as it offers a whole bunch of additional side buttons and extra features, whereas the other mice in this list are pretty bare-bones on that front. All in all Logitech accounts for almost half of the professionals’ mice, so they certainly are doing multiple things right. 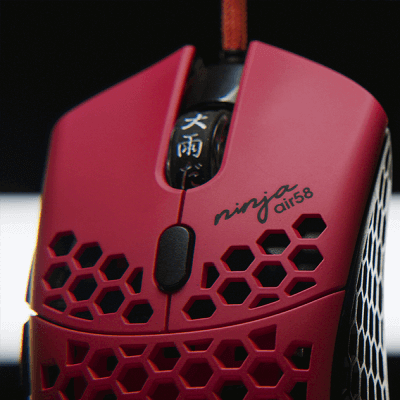 In second place we find FinalMouse’s Air 58 Ninja. Ninja is the most popular Fortnite streamer (and, by extension, one of the most popular streamers in general) and his collaboration effort with FinalMouse seems to have enamored lots of other professionals. Razer also finds its way into this top 5, with the legendary DeathAdder taking fourth place. Seeing someone with a wireless gaming mouse used to be a clear sign that that person was a noob but these days wireless mice have definitely caught up to their wired counterparts. Logitech says that their LIGHTSPEED technology is as fast, and in some cases even faster, than wired mice and that’s a very impressive feat in itself. That’s not all there is to love about the G Pro Wireless though. 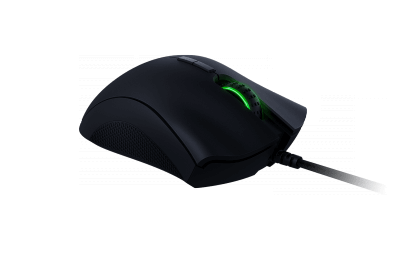 It has a stunning battery life of over 40 ingame hours, packs their flawless HERO sensor (which is an in-house version of the 3366) and is capable of charging through their POWERPLAY technology, meaning that if you use this mouse with a POWERPLAY mousepad you’ll never have to plug in the mouse. Logitech has been working with professionals in order to come up with the best mouse they could make, and it really shows. The shape is fantastic and should suit a very wide variety of grip types (which is something that arguably couldn’t be said about the G403 and ‘OG’ G Pro shapes) and the fact that it’s a truly ambidextrous mouse (you’ve got modular side buttons, which means lefties can easily use this mouse to its full potential as well) is just icing on the cake. Logitech’s internals have always been great, and now that they’ve come up with a flawless wireless mouse with a super comfy shape it’s not a real surprise that they’ve shot up to first place. The G Pro Wireless truly is a fantastic gaming mouse. If you’ve got the budget for it we can definitely recommend it for all types of grip, provided your hands aren’t of a really unusual size. Going wireless without any sort of noticeable lag is a fantastic experience, doubly so if you can do it with a great feeling mouse, and that is definitely what the G Pro Wireless is offering here. It’s also the only truly ambidextrous mouse in this list, so if you’re a lefty and you want to grab a mouse that the pros are using we can strongly recommend this one as well. Most FPS gamers seem to agree that weight is one of the most important aspects to a gaming mouse. If you’ve got a brick in your hands you won’t be able to swiftly and fluidly move your mouse around the pad which can cause you to miss important shots. 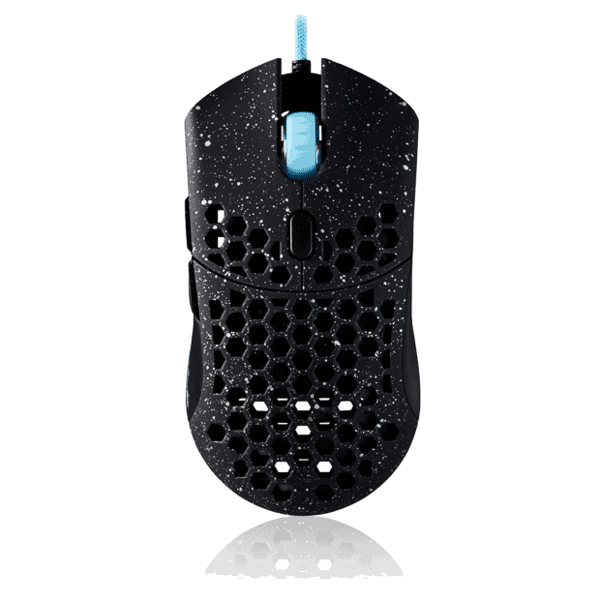 FinalMouse really doesn’t seem to want you to miss any important shots, and for some time now they’ve been designing their mice to be the absolute lightest out there. The Air58 lives up to its name; it’s made of mostly air (the holes in the shell are designed to have the mouse weigh less) and is advertised to weigh 58 grams. That’s absolutely insane and makes it the lightest (gaming) mouse on the market by a very comfortable margin. FinalMouse teamed up with Richard Tyler “Ninja” Blevins to make this mouse, but not that much has really changed since the earlier UltraLight Phantom model. The Air58 is lighter and offers an improved scroll wheel, but aside from that it’s basically the same mouse. That’s not an issue though, as the UltraLight Phantom was a great mouse already. The Air58, like its predecessor, has a flawless 3360 sensor and a nice and comfortable shape. Pair that with the super flexible phantomcord (which is their name for their mouse cable) and you’ve got a mouse that glides over your pad with the ease and grace of a ninja ready to strike his target. If you’re looking for the lightest mouse you can find with an ergonomic shape, extremely flexible cable, and top internals this is the one for you. Like real life ninjas these mice are quite elusive, though. 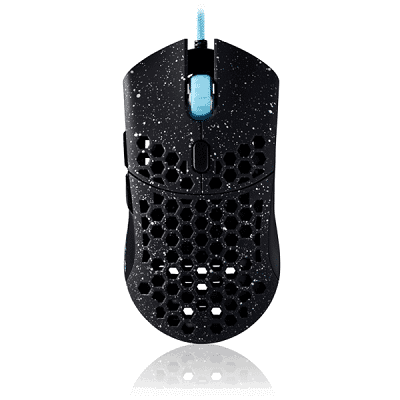 FinalMouse only seem to release their products in very limited quantities, which means getting one is a matter of following their socials and then refreshing the page whenever a new ‘drop’ is announced. They’re fantastic products and we applaud the innovation they’re bringing to the market with their shell design and phantomcord, but it’s tough to recommend a mouse that’s almost never available. If you manage to catch them when they become available it’s absolutely a great buy, but we do recommend buying at retail price and to leave the ‘scalpers’ who buy these mice and then try to sell them for multiple times the MSRP in the dust. The DeathAdder has been around for over a decade now. A mouse that’s been surviving for that long must be doing something right, so it makes sense that it’s still used by so many people and the Elite is just objectively a very good mouse. Previous iterations of the DeathAdder sometimes had one or more issues (that’s the same for most companies though, it’s not a dig at Razer) that plagued it, but the Elite really is a home run. Razer’s marketing has always been pretty aggressive, which makes sense, you have to sell your product in the end, and we all know marketing departments sometimes like to over exaggerate claims, but the DeathAdder really is top of the line. 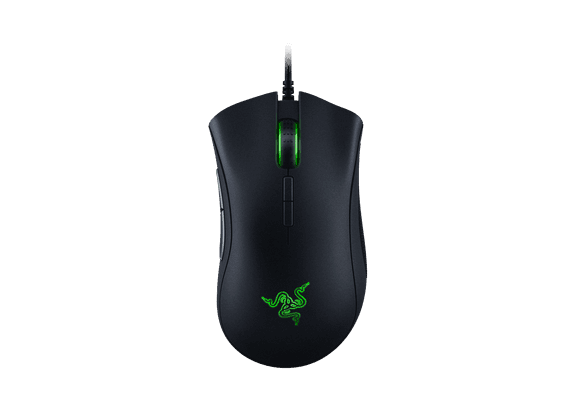 It features Razer’s version of the flawless 3360 sensor, as well as switches which were co-developed with Omron. These provide a pleasant and crisp clicking experience, as we’re used to from Omron. The sensor can go up to a whopping 16000 DPI, though that’s more of a marketing gimmick than a performance feature, since nobody in their right mind would set their DPI that high. Using the DeathAdder at a regular DPI setting is a blast though, as the 3360 is a sensor which captures your movement with the utmost precision. The shape is rather safe, but it has to be mentioned that it’s not really a mouse for people with small hands. It should suit most grip styles however. The DeathAdder Elite comes in at roughly 98 grams, which doesn’t make it the lightest mouse on the planet, but it stays under the mythical 100 gram mark which most mouse enthusiast people seem to think is the line between a brick and a usable mouse. 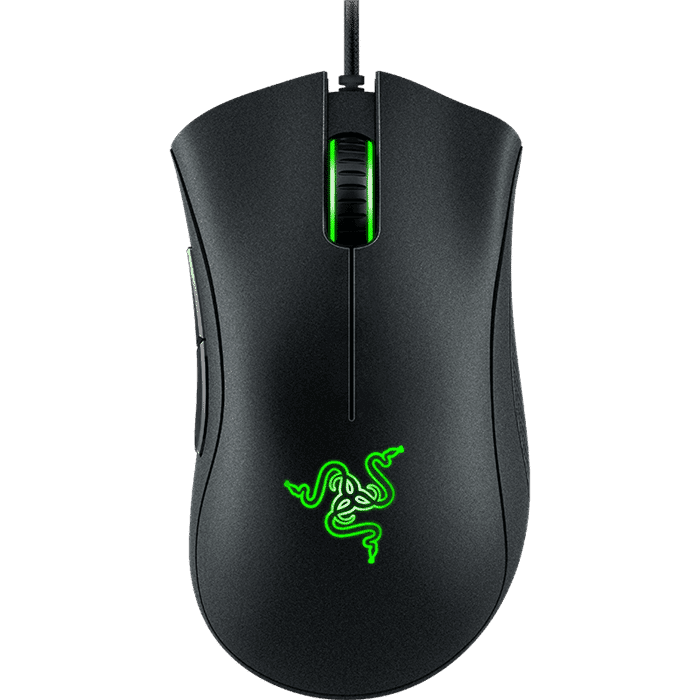 The DeathAdder is an old warrior when it comes to gaming mice. It’s been going through multiple iterations at this point, and its newest arrival hits the mark on all of the important points. If you’re looking for an ergonomic mouse with a flawless sensor and crisp and responsive clicks you should be glancing at the DeathAdder Elite as well. If you care about that sort of thing it also has nicely implemented RGB lighting. It’s pretty large and on the heavier side when it comes to ‘shooter mice’ though, so if you absolutely want a super light mouse or you have smaller hands then you should be wary. The UltraLight Phantom was a limited release by FinalMouse. 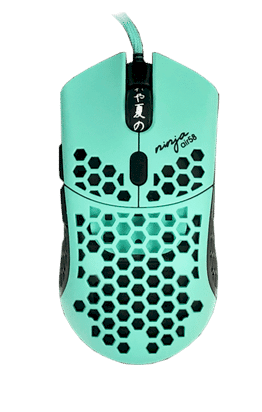 It was the first FinalMouse product to introduce the shoelace cable which is now also on the Air58 Ninja. We hate to disappoint; but it won’t be this one. Or at least it shouldn’t be this one. The FM UL Phantom was a limited edition release and it has been sold out for a long time now, meaning you can only find this mouse on the aftermarket where they’re being sold at outrageous prices. If you somehow manage to find a working one at retail price we can definitely encourage you to try it out, but the Phantom is so hard to come by (even harder than other FM products) that it’s going to impossible to do that. 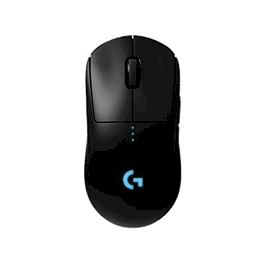 In a way the G Pro Gaming Mouse is the predecessor to the current number one, the G Pro Wireless, but both mice have very little in common. 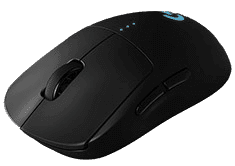 Developed and released back in 2016, the G Pro (which was launched alongside the G403) was among the first mice to feature a flawless sensor. The G Pro wired was developed with the help of various professional players, and it was an almost instant hit. The original G Pro has a small, ambidextrous design (though there are only side buttons on the left side of the mouse) with super light clicks and a rather sturdy cable. Logitech has since made some improvements on this original design, and some time ago they did away with the cable (which was an often criticized aspect of this G Pro) entirely and released a wireless version. Weirdly, the wireless version of this mouse design is called the G305 (review here) and not the G Pro Wireless. When the G Pro Wireless was released in the summer of 2018 Logitech also updated the original G Pro Gaming Mouse with a better cable and the HERO sensor. 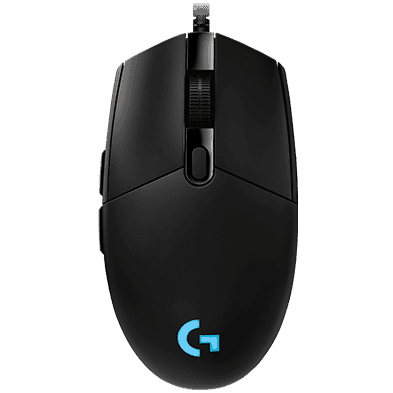 If you’re a fan of smaller mice and/or you’re not ready for the wireless G305 version of this mouse you can still buy the original G Pro. It’s still very much a fantastic gaming mouse, as is evidenced by the amount of pro players still using it. It’s a compact, lightweight (about 85 grams) mouse and it has just about the lightest buttons we’ve ever seen on a mouse, so if that’s something you’re aiming for you should definitely consider the G Pro wired. Contrary to, for example, our Top 5 CSGO Mouse List, there isn’t one really big consensus here when it comes to what kind of mice the Fortnite pros use. There’s bleeding edge technology in here, but also some more traditional ‘oldschool’ types of mice with about 50 grams of difference between the heaviest mouse in this list and the lightest one as well. So in truth there isn’t really a consensus, at least not when it comes to what the Fortnite pros use. Every mouse on this list is a great mouse in its own right though, so please; take your time, absorb the information we’ve given you here, and use that as a guideline for choosing your own mouse. We hope this guide has helped you a bit, and good luck out there!